Swing sets could be considered a staple of childhood. Most of us had one growing up; those who didn’t at least had access to one courtesy of friends, neighbors, cousins or local playgrounds. A generation ago, the ones for home use didn’t really have a lot of options, did they? Typical metal A-frames held up traditional swings and slides. Some came with gliders and trapezes. We may not have had a lot of extra bells and whistles back then, but what we lacked in features, we made up for with our imaginations! Those standard belt and platform-style swings did pretty much anything we wanted. We could stand up, sit down, lie on our bellies scraping the dirt with our fingers and toes or take imaginary train rides without really moving more than a few inches. We swished, swayed, twisted, spun and pulled stunts daring enough to impress our friends and make mom’s heart skip a beat. Certain folks from our time took a lot of mental notes over the years. As it turns out, some of them grew up and became the designers and engineers who created a whole new generation of swing sets offering all the extras we only wish we’d had. They’re now available to our kids and grandkids, and the most difficult part of the purchasing process is deciding exactly which ones would be the best fit for our little ones. Obviously, not all swing set amenities are appropriate for all age levels. Still, you’ll find something catering to your children’s fancies whether they have yet to start walking or are running off to middle school. When it comes to including the smallest among us in the fun of a backyard swing set, safety is a primary concern. 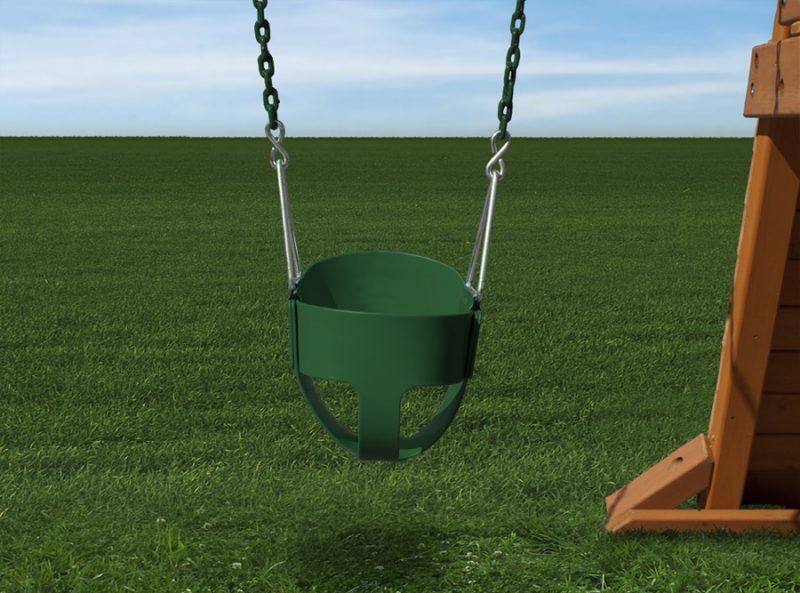 Conventional swing seats just don’t offer the support and restraint smaller children need. Plenty of manufacturers have taken this into consideration, providing seats designed to give infants and toddlers the best of both worlds. For the toddlers, traditional bucket swing seats offer back, tummy and bottom support. Made of a semi-flexible molded polymer, their seat openings are large enough to let little legs slip through but small enough to prevent the little guys and girls from falling out completely. Most manufacturers and universal safety guidelines recommend only those ages two and up make use of these options. While some are said to hold up to 60 pounds, many come with a 40 to 50 pound weight limit. If you’re looking for something a little more robust than the standard polymer, you’ll also find some heavy-duty hard plastic models on the market. They’re designed for the same age bracket as the previously-mentioned variety but they tend to withstand a bit more weight. They also offer a little more room to move around and have slightly larger openings for your toddler’s legs. Similar to bucket swings, half-bucket seats offer stable support on one side and a chain enclosure on the other. Also meant for toddlers, these can actually be used in two different ways. Smaller, less stable little ones in this category may sit with the wider support band against their bellies and their legs secured in the featured openings. 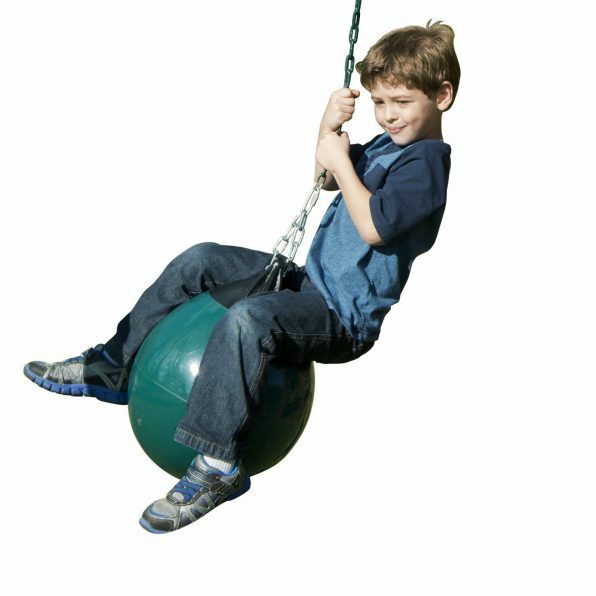 Once your toddler grows a bit and becomes more accustomed to the balance needed in a swing, he or she could easily sit facing the opposite direction with the chain in front and legs dangling a little more freely. 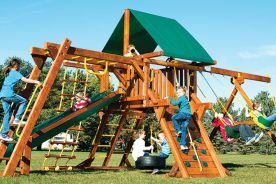 While half-bucket swings are available from a number of different manufacturers, Gorilla Playsets’ contribution to the lineup can be found on Amazon by visiting them here. 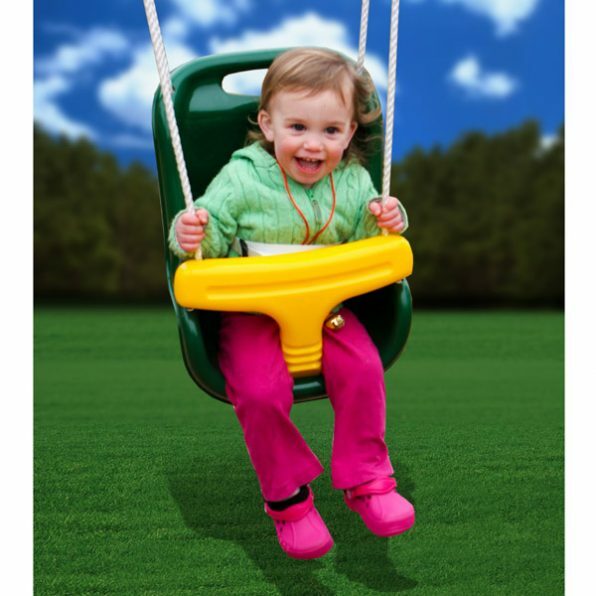 This particular model is offered in yellow, green or blue with a pink version also available for the little ladies. 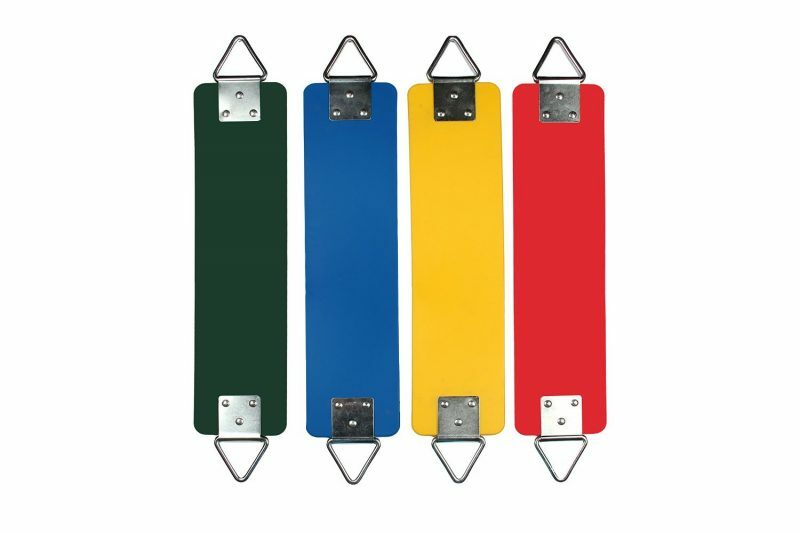 Though it’s recommended for children three to five years old, it’s built to hold up to 75 pounds. Pre-toddlers need a good bit more security than slightly older children but they love to feel the freedom and wind in their hair no less. Hard plastic high-back swings cover your bases well in this regard. In addition to the extra neck and back support, these models typically feature T-bar lap belts. Some are fixed whereas others can be lowered for easier entry, and locked in place while in use. Many also include cloth seat belts for added peace of mind. Well-known names in the play set industry, like Backyard Discoveries, Step2 and Little Tikes, have brought some even more accommodating options to the market. 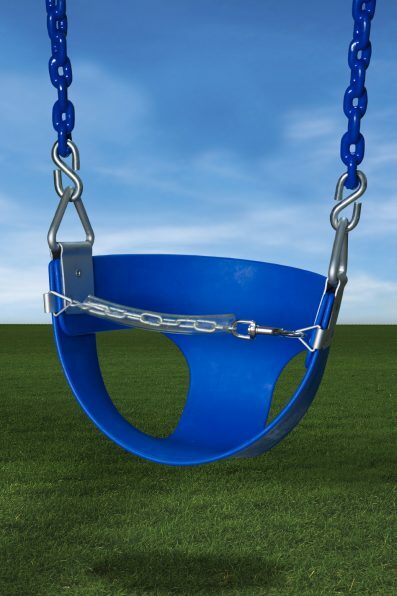 Each caters to the needs of a wider age range by converting from infant to toddler swings. Whether you choose a swing strictly for infants or one of the transitional versions, they’re safe for babies as young as seven months. Although these serve their purposes well, some little guys and girls like a bit more character than what’s displayed in the standard choices. The ever-popular blue dolphin is a case-in-point. 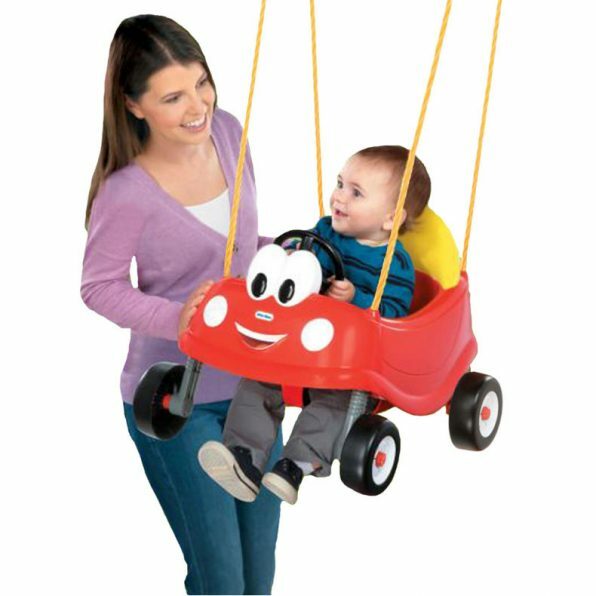 Aside from that, you and your little fun seeker might also be interested in Little Tikes’ swing-adapted take on their Cozy Coupe or the Johnny Tractor Swing from John Deere. Babies and toddlers certainly have their fair share of swing set accessories. Once you pass the earliest years, though, the options only branch out further. This is where the real fun begins! These are the flexible plastic seats we all know from childhood. 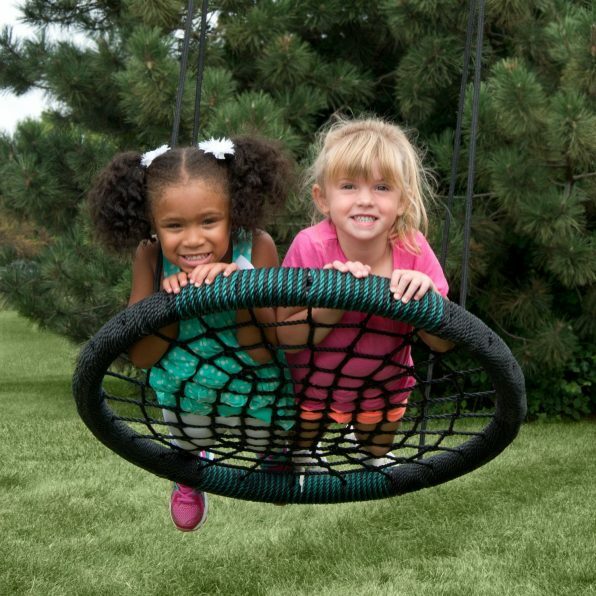 Ages three years and older can have all the traditional fun they like on these seats and they hold up to 225 pounds. 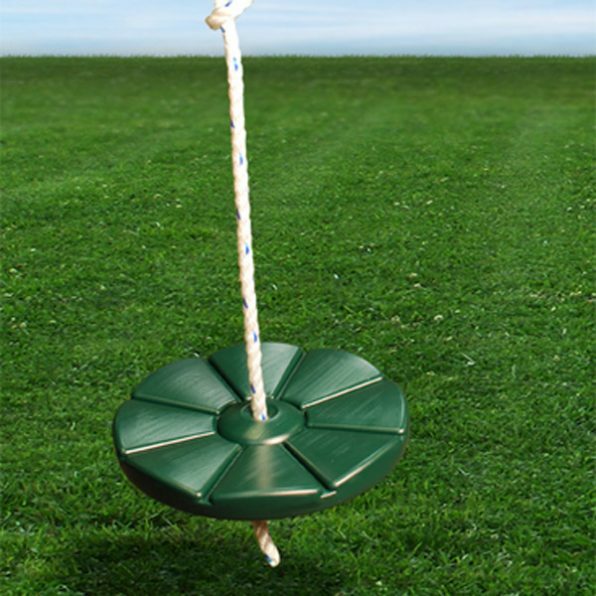 Disc swings of years long gone were made of wood, but modern versions are composed of polyethylene. When attached to the right rope, your post-toddler progeny can swish, sway and spin on these swings until they pass the 110-pound mark. It works whether they’re sitting or standing. Gliders are the rocking horses of the swing set world. You’ll find versions allowing your children to fly solo as well as those built for two. But if you choose the double-rider option, your child can enjoy it alone or with a friend. For more comfortable and versatile swinging options than belt seats can provide, web swings are the answer. They feature polypropylene netting designed to not cut into your children’s skin, and are surrounded by a padded steel rim. Swing-N-Slide’s version found here measures 42 by 33 inches at its base and will accommodate up to three kids as long as their collective weight doesn’t exceed 250 pounds. Smaller models are available. Many of these are designed to take your child from just past the toddler years through the “big kid” phase without sacrificing safety. Of course, as their coordination and imaginations grow, so does their range of options. The excitement never ends. Though the swings listed for smaller children can easily keep bigger kids entertained for hours on end, an entire selection is geared specifically toward the more “grown up” crowd. These kiddos are generally looking to branch out from the norm a bit. While they’re probably not opposed to finding ways to make the standard belt swings meet their expectations, plenty of alternatives are on the market to let them soar to new heights. 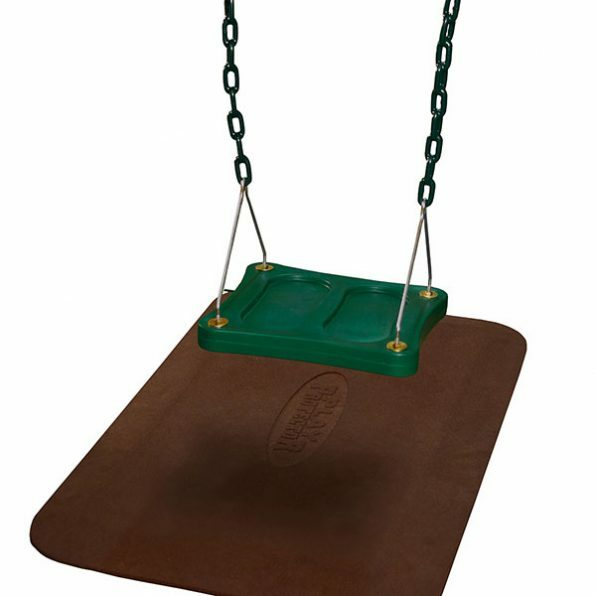 Truthfully, if a child’s feet can fit on a swing seat, he or she is going to try standing on it. 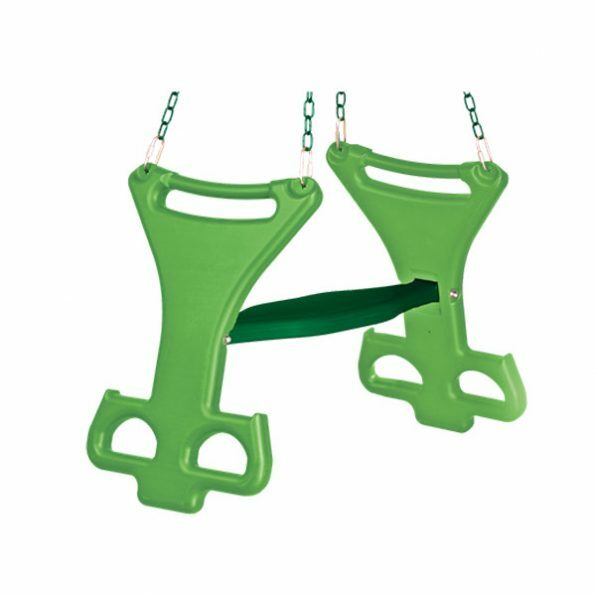 Stand-up swings are built for just that purpose with a wider base than most other options. If you ever stood up to swing during your own childhood or beyond, you’re probably well aware back and forth aren’t the only directions available. The only elements holding you back were the ropes or chains, right? 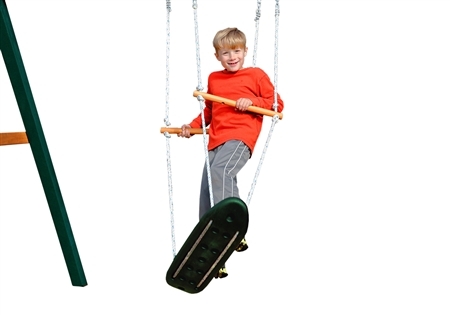 Skateboard swings offer the added stability and mobility your child needs for multi-directional flight. Though they’ve been dubbed skateboard swings for marketing purposes, they can technically be snowboards, hover boards, surfboards or anything else your child’s imagination deems fitting. Ball or buoy swings like the one found at Amazon are meant to be inflated and suspended from your backyard play set. Your little guys and girls can climb on these and become an entirely new force of nature, pretending they’re crashing into buildings or bobbing along a river. They also happen to double as punching bags once the ride is over. 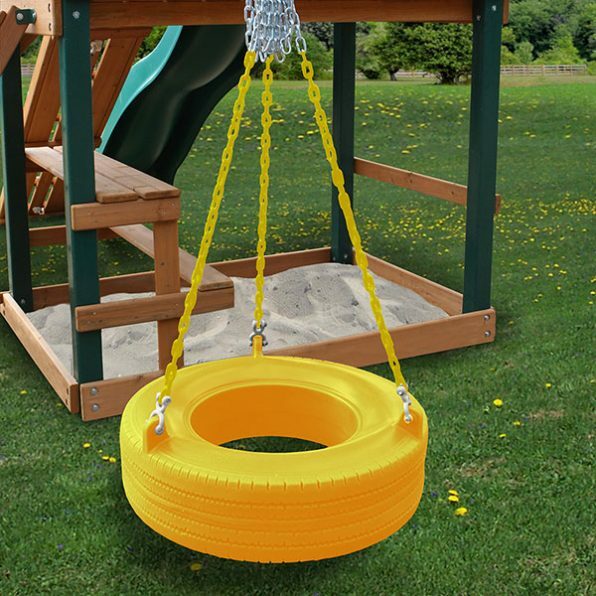 As many adventures as your children can build with these accessories, present day’s answer to the classic tire swing is also well worth mentioning. Designers have veered away from the much-loved dry rotting rubber ring filled with decaying leaves and stagnant water from our generation. Modern kids can now enjoy colorful, fully enclosed molded plastic versions of the old favorite. Keep in mind, these are all accessories. 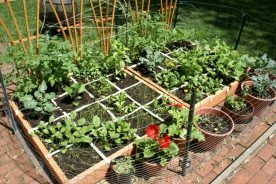 Start with a large basic play set framework, and a swing set can grow and evolve right along with your child from infancy through the older years. If you let imagination be your guide, no height is unreachable!